The allure of all things British — from classic luxury fashion brands and iconic beauty brands to the beloved royal family — has had Korean consumers spellbound for many years. But as U.K. Prime Minister Theresa May started last month the two-year negotiations for the country to leave the European Union, following the "Brexit" vote last year, many economic partners, including South Korea, are seriously pondering British prospects in terms of trade and investment. Sean Blakeley, the CEO of the British Chamber of Commerce in Korea (BCCK), sees this uncertainty as an opportunity. "Post-Brexit, Korea was one of the first countries to come out and say it was keen to have a bilateral trade agreement with the U.K., which was very positive," Blakeley said during an interview in the chamber's office in downtown Seoul, adding that the British government also confirmed Korea to be among the priority countries for bilateral trade agreements. "The signs are positive between the two countries, and I think it is more of an opportunity than a concern." Last December, Korean Industry Minister Joo Hyung-hwan and U.K. International Trade Secretary Liam Fox agreed to work toward a bilateral free trade agreement that would be uninterrupted in the wake of Brexit and be at least at the level of the South Korea-European Union Free Trade Agreement. They also agreed to set up a trade working group that would meet four times a year. "Because trade has increased under the Korea and EU agreement, any bilateral agreement that will be produced can add features to make it stronger," Blakeley envisioned. He saw significant potential in the areas of renewable energy and nuclear decommissioning. And with regard to concerns about London losing its financial hub status, Blakeley assured that nothing will change, that London remains in the same time zone necessary to deal with the United States and Asia, and that there are top services to support institutions that have global or European headquarters. "Also, the British government said it will work keenly on the passporting issue," which benefits foreign banks that have subsidiaries in the City of London by giving their employees access to the EU market through the issuing of passports. In addition, fintech is an area where synergy between South Korea and the United Kingdom can be high, he said. "Last year, Level 39, a financial accelerator space, said it would set up its Asia hub office here through XN Tree, and discussions are ongoing," he said. Level 39 has a 7,400-square-meter fintech accelerator space in Canary Wharf, London, and more than 200 fintech startups as members. The U.K. government is moving aggressively to ease any short-term uncertainties, he said. But overall, any short-term uncertainties should be addressed in the long term. "It is hard to change the fact that the United Kingdom has one of the lowest corporate tax rates in Europe, 19 percent, among the G7 countries, the highest transparency grades in the European Union, and the world's top talent in multiple industries, and the fact that is a still huge innovator across sectors," he said. Korea and the U.K. have vital ties; Korea is the U.K.'s 15th-largest trading partner and third-largest consumer market. The trade volume between the two countries holds at around $13 billion. The two governments also work together through the Korea-U.K. Joint Economic Trade Committee (JETCO), which serves as a ministerial-level forum and has held annual meetings in the past couple of years. The last JETCO meeting in December 2016 confirmed the establishment of a trade working group to discuss a potential bilateral trade agreement, and it will now hold quarterly meetings led by John Alty, director general of trade policy in the Department for International Trade from Britain, and his Korean counterparts at the ministry of trade, industry and energy. Should consumers be worried about possible price hikes in British products including luxury brands such as Burberry? "If you look at statements made by the British government, there should be no interruption in the trade between the two countries, and if you think of it this way, any rise in a Bentley car means a rise in a Hyundai car going to U.K.," Blakeley said, explaining why there is no benefit in price increases for either party. Blakeley said the attractiveness of the Korean and the U.K. markets to each other is very clear. Blakeley, who earned his bachelor's degree from the University of Leeds, has lived in Korea for the past 12 years, including when he earned his master's degree in international relations with a focus on the North Korean economy at Seoul National University. Before joining the chamber 18 months ago, he was director of business development at a Korean publishing company, the managing director of a British consulting company, and worked at GE Capital U.K. The BCCK, a nonprofit organization in which a majority of members are British companies, has become much bigger now and has a more extensive role in volume-trade areas. The chamber helps British companies in all sectors that are looking to enter the Korean market, while the strategic value trade in energy and defense contracts are still handled by the British embassy, Blakeley said. An expert of both the Korean and U.K. markets, Blakeley has worked with companies across a broad range of sectors, including electronics, retail, consumer goods and food and beverages. He said the Korean market is growing in fashion, retail and consumer products, music and creative industries, and it is a very trend-driven market with significant trade potential with China, Japan and South Asia. "Also, Korea has strong conglomerates globally and in third-party countries, so if you can secure a relation with Samsung or LG, you can sell products in India, Africa and South America. The global reach of Korean companies has been growing," he said. There are certain similarities between the peoples of the two countries, he said: "both are conservative outside but have a hidden passion and eccentricity on the inside." 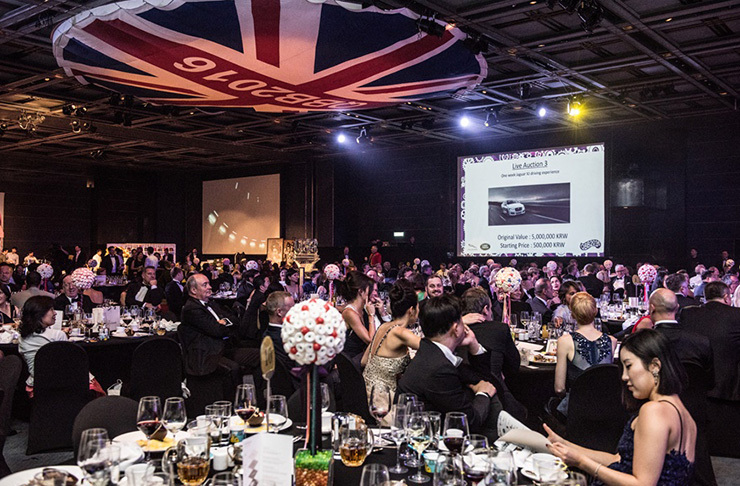 One of the chamber's events to watch for this year is the black-tie ball with a British theme on May 27 at Grand Hyatt Seoul to commemorate Queen Elizabeth's 91st birthday. For more, visit www.bcck.or.kr.